The fifth annual Bed-Stuy Pride was held on Sunday, finishing off a month of actions in support of queer, trans and gender nonconforming people of color. 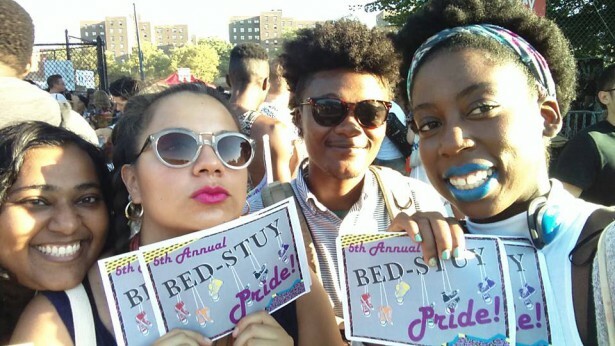 The Brooklyn neighborhood of Bedford-Stuyvesant hosted the fifth annual Bed-Stuy Pride on August 30, finishing off a month where activists held multiple actions in the borough to bring awareness to the struggles and violence faced by queer, trans and gender nonconforming people of color. The event was put together by the New York City-based Audre Lorde Project, which describes itself as a center for community organizing of lesbian, gay, bisexual, two spirit, trans and gender nonconforming, or LGBTSTGNC, people of color. Bed-Stuy Pride is part of the group’s “Safe OUTside the System (SOS) Collective” program, which aims to bring communities together and provide them with resources and strategies for preventing and challenging hatred and police violence against LGBTSTGNC people-of-color rather than relying on the police themselves for security. From about 12 p.m. to 6 p.m. on Sunday, hundreds of people visited Herbert Von King Park to meet a variety of local, queer-friendly vendors, poets, artists, health care providers and activist organizations. While the stage hosted entertainment like music, drag shows, and anti-hipster poetry, vendors on the lawn sold locally-made products. Artists created and exchanged their work, and people were connected with resources like health care, housing and self-defense classes. The event is one of a few that caters specifically to LGBTSTGNC people-of-color and actually takes place in a community-of-color. Amid all the celebrating at Bed-Stuy Pride, the violence and adversity that queer, trans and gender nonconforming people-of-color face was not forgotten or downplayed. There were square patches of cloth adorning a clothesline not too far from the vendors. On each piece of cloth was a short story of experiences with violence or bigotry alongside stories of resistance. 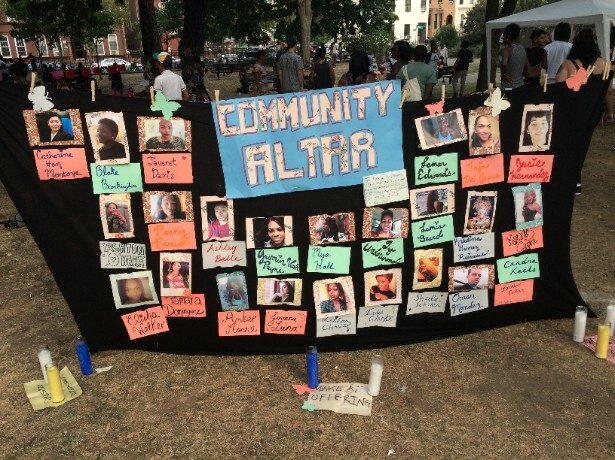 There was also a community altar with the pictures of LGBTSTGNC people-of-color who have been killed in 2015. This year, at least 19 trans people have been killed. These stolen lives were also commemorated at another event in Brooklyn on August 25. Joining actions in 13 other cities, hundreds of people gathered in front of Brooklyn’s Barclays Center for Trans Liberation Tuesday. Hosted by Joshua Allen of FIERCE, Aaryn Lang of the National LGBTQ Task Force, and activist Cherno Biko, the vigil brought together people to remember and mourn the deaths of black trans women killed in 2015. Black, cisgendered men were invited to stand towards the front and hold up the images of black trans women who were killed. People sang and recited poetry, and the hostesses led the crowd in saying the names of all the murdered black trans women. The hostesses also reminded the crowd that supporting trans and gender nonconforming people means more than “just a retweet” or voicing support from the sidelines. They emphasized that showing solidarity meant sharing your money and resources with trans people, putting your body on the line, and standing up for trans and gender nonconforming people even when there’s no audience around. The vigil then ended with a remixed version of Janelle Monae’s protest song “Hell You Talmbout” with the names of murdered trans women replacing the names used in the original. Days earlier in Brooklyn, on August 22, Biko and Allen, along with scores of other people, took over three stages at AfroPunk Fest during their trans march for justice. Chants of “Black Trans Lives Matter” and “No Justice, No Peace!” stopped bands from playing after which Biko and Allen took over the mics, spoke about the epidemic of transphobic violence, led the crowds in chants, repeated the names of murdered black trans women, and also led the crowd in singing the black trans version of “Hell You Talmbout.” Although the activists had coordinated things beforehand with AfroPunk’s organizers (people who signed up for the march even received free tickets to the festival), there was an unplanned moment when it looked like the activists were going to be silenced. The crowd began chanting “Let them speak!” and activists, who remained on the stage unmoved, finally got the mic. Although each of these events went on without any serious problems, one message in all of this month’s actions in Brooklyn remained clear: Despite the increased visibility and acceptance of queer, trans and gender nonconforming people-of-color, bigoted violence still threatens this community everyday and these actions only represent the beginning of the struggle.